Charles Carroll grew up in a family-owned country inn. From first grade and up he had to work 8 days a week because that is what you d0 in a family business. In 1985, Chef graduated from the Culinary Institute of America and began his career at the Balsams Grand Resort Hotel, a four-star four-diamond resort located in Dixville Notch, New Hampshire. While there, he worked his way up to his first Executive Chef position, and also served as Apprenticeship Coordinator for one of the country’s leading apprenticeship programs. In 2000, he joined the River Oaks Country Club Culinary team in Houston, TX as Executive Chef. Charles has been on 8 different Culinary Olympic Teams representing the USA, winning numerous gold medals. He has received over ninety national and international awards, including chapter Chef of the Year in 1988, 2005 and the American Culinary Federation President’s Medallion four times from four decades (1989, 1999, 2005 and 2014). In 1993, Charles was selected by The James Beard Foundation as one of the Great Country Inn Chefs and was awarded Educator of the Year by the ACFEI. He received the Central Regional “Good Taste Award” in 2006 and Sharing Culinary Traditions Award from the American Academy of Chefs as well as the regional and national winner of the Chef’s Professionalism Award in 2008. He has been nominated twice for ACF regional Chef of the Year. Since the year 2000, he has been inducted into the World Master Chefs Association (2000), the American Academy of Chefs (2001), the Confrerie de la Chaine des Rotisseurs (2002), and the Honorable Order of the Golden Toque (2005). Chef is a recipient of the Distinguished Visiting Author Award presented to him by Johnson and Wales University, as well as Distinguished Visiting Chef by Sullivan College and honored by Grand Rapids Community College, New England Culinary Institute and Paul Smiths College; and received the Lifetime Achievement Award by Cordon d’ Or and the Crystal Icon Award by the International Special Events Society. He was most recently awarded with the title of Ambassador for the Culinary Institute of America (CIA). In 2011, then again in 2013, Chef created and produced “Operation HOT” (Honoring Our Troops). He put together a team of 21 celebrities and a support team, raised $450,000, assembled 30,000 lbs of show gear, produced a total of 8 shows (2 Vegas Style), and fed 8,000 troops a home cooked meal in the middle of a war zone in Afghanistan. For his collective efforts in organizing these events, Chef Carroll was recognized by 5 past U.S. Presidents, and invited to the White House. In September of 2013 he was presented with The Honorable Order of Saint Martin Award, given to him by the Army for his significant contributions to soldiers based in the Middle East. 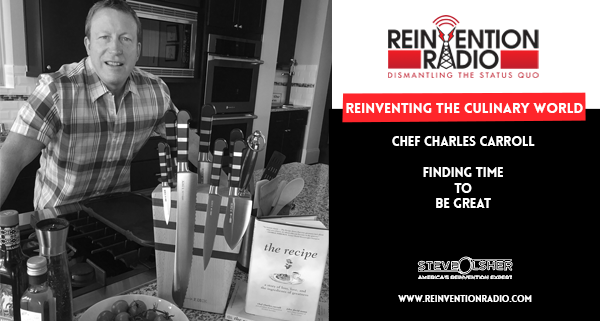 TUNE IN to this episode as Chef Carroll chats with Steve, Mary and Richard chat with Chef Carroll about the ingredients of greatness and finding the time to be great. I just can't wait to get out of bed every morning. @ChefCharlesCarroll explains why it's all about the wins. 1 – A poster child for reinvention; Who knew there was such a thing as a Culinary Olympian? ; How he knew this was his WHAT; What’s for dinner tonight? 3 – The Culinary Olympics are every 4 years; Life in Houston after Hurricane Harvey; The Recipe book release in October; Food is like music and triggers food memories. Reinventing Words – In this episode, John David Mann chats with Steve, Mary and Richard about how he searches out transformational ideas and stories, bringing them to life in words.